Ordinary, unremarkable life is the norm for most places and most people. But sometimes stuff happens, even in remote villages like Little Wigborough, a habitation on the salt marshes of the Blackwater estuary in Essex. Two days stand out, two days in the thousands that have passed since the village was recorded in the Domesday Book as Wigheberga, the possession of one Hamo Dapifer. The Colchester earthquake, later dubbed the Great English earthquake, strikes. It is the most destructive earthquake in England for more than four hundred years. The tremors are felt throughout the southern half of England and across the Channel. The villages of Wivenhoe and Abberton are almost flattened. The Essex County Standard reports that at Langenhoe ‘women and children rushed out of their houses in the greatest terror, many of them shrieking in the roads, while men were also startled’. 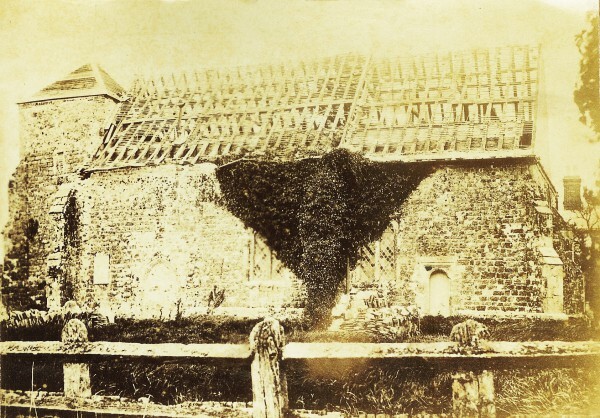 The destruction in Little Wigborough is substantial and the parish church of St Nicholas is severely damaged: its upper tower collapses, the tiles are ripped from its roof, and fissures are opened in its walls. The rebuilding of the church takes four years and leaves it as it looks today. And then the ordinary life resumes. Two years into the Great War, a fleet of twelve Zeppelin airships is returning to Germany, having spent the night lighting up the sky with magnesium flares and dropping bombs on southern England. The Zeppelins cross Essex, heading for the North Sea, but two of the craft have been crippled by anti-aircraft fire. Zeppelin L32 crashes at Great Burstead and the explosion on impact kills all the crew. Zeppelin L33 makes a forced landing at Little Wigborough, close by St Nicholas’. Incredibly, the crew walks away unscathed. The commander, Kapitanleutenant Alois Boecker, orders his men to set fire to the Zeppelin to prevent the technology falling into enemy hands. In one of those seeming paradoxes of wartime, Boecker, who just hours before was death-dealing from the air, warns the inhabitants of nearby cottages of the pending explosion. The villagers stay indoors, perhaps thinking that this is the much-feared German invasion. With their airship in flames, Boecker and his men decide to head towards Colchester to give themselves up. 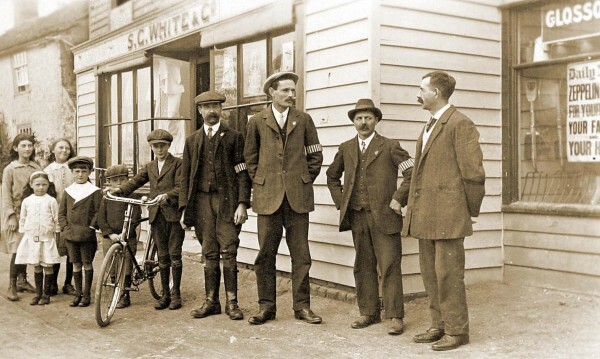 Before they get out of Little Wigborough they are confronted by Edgar Nicholas, a special constable on a bicycle, who promptly arrests them. The prisoners are taken to Mersea Island, the closest army garrison, where they are held in the parish hall. 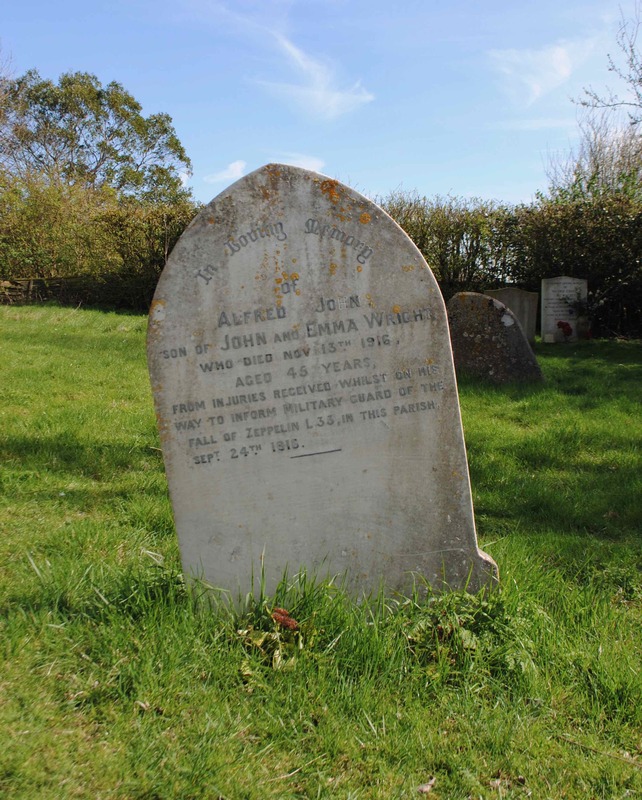 They are treated humanely by their Essex hosts and given cups of tea and first aid, although the vicar has to placate some angry locals who threaten a lynching. Another death and a birth are connected with Zeppelin L33. Not long after the crash, Alfred Wright, a local farm worker, speeds off on his motorcycle to alert the garrison at Mersea Island. He hits a car on one of the lanes and dies of his injuries seven weeks later. Wright is buried in the churchyard of St Nicholas’. And a girl is born that same night at one of the cottages in Little Wigborough. The doctor who delivers her suggests a name and she is christened Zeppelina. Inside St Nicholas’ today is a plaque to Zeppelina Williams, who died in 2004, at the grand age of 88, a child of wartime whose birth was heralded by a falling Zeppelin. 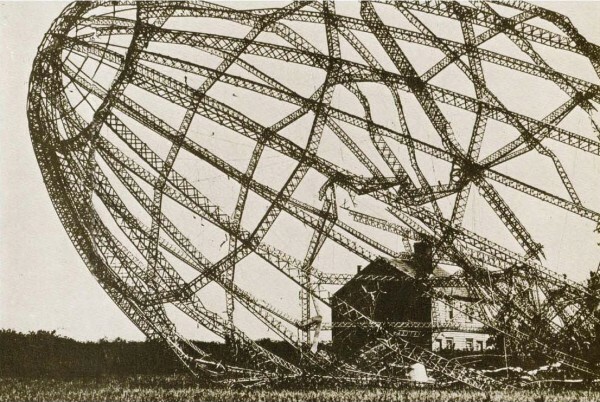 PS More on Zeppelin L33 at the Essex Record Office and the Mersea Museum.